Primary peritoneal carcinoma, also known as PPC, is a cancer that develops in the peritoneum. In many ways, PPC is much like an epithelial cancer that develops in the ovaries. However, a woman who has undergone the removal of both ovaries can still develop this particular form of cancer. PPC also goes by other names. Because this rare form of cancer develops outside the ovaries, it is sometimes known as extra-ovarian primary peritoneal carcinoma, or EOPPC. Other health professionals refer to this type of cancer as a serous surface papillary carcinoma. Under any of these names, the cancer has the potential to be deadly, if it is not diagnosed and treated in a timely manner. In terms of symptoms, PPC is very similar to epithelial ovarian cancer. There is still the pain in the general area of the pelvis, an increase in girth, a growing sense of fatigue, and increased irritability and possibly some amount of moodiness. Many women also experience periods of indigestion that lead to bouts of nausea and vomiting. Other signs and symptoms include a loss of appetite that is accompanied by noticeable changes in the usual function of the bowels. When blood tests are ran, there is often an elevation in the level of CA-125 found in the bloodstream. Because of the similarities in terms of symptoms, many physicians will look for signs of ovarian cancer first, then consider the possibility of a primary peritoneal carcinoma when it is determined that there is no epithelial tumor present. 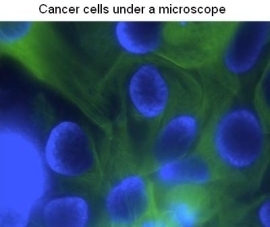 Even when looking at this form of cancer with the use of a high-powered microscope, it is difficult to tell the difference to epithelial ovarian cancer. The cancer tends to spread across the surface of the abdominal and pelvic lining, a factor that makes it very hard to determine exactly where the tumor first developed. In fact, just about the only clear-cut difference between PPC and ovarian cancer is that the tumor develops outside the ovaries. It now seems that this has in the past led to a proportion of primary peritoneal cancers to be mistakenly diagnosed as ovarian cancer. Some studies indicate that 7?20% of initially diagnosed epithelial ovarian cancers could be properly reclassified as primary peritoneal cancers. When it comes to treating this type of abdominal cancer, the process is very much like that of dealing with ovarian cancer. In fact, the treatment and prognosis is the same as for epithelial ovarian cancer. Depending on the condition of the mass when it is first diagnosed, your physician may prefer to try chemotherapy before moving on to any type of invasive technique. However, if there is ample evidence that the progress of the disease is advanced, there is a good chance that surgery will be scheduled immediately. Even when surgery is used to remove the growth, it is not unusual for the patient to undergo at least a short set of chemotherapy treatments. Just as ovarian cancer can be detected in time, primary peritoneal carcinoma can be diagnosed and successfully treated before any long-term health issues develop. Because PPC can spread rapidly, it is important to alert your doctor to any unusual pain in the pelvic area, as well as any type of change in your bowel function or your desire for food. While each of these symptoms can point to health issues other than cancer, making it a point to seek medical advice early on can mean the difference between living many more years or waiting too late for effective treatment.